Additionally, high rise apartments in densely populated areas are expensive and this in turn creates a much greater expectation on the performance of the building. For homeowners or tenants, noise pollution - from either internal or external sources - is their greatest concern as it is a major contributor to disturbed sleep. This elevates the importance of acoustic drainage as people expect a property to be free from the sound of running water when the occupants of the flat upstairs take a shower or flush the toilet. It goes without saying that small changes to the specification of drainage can make a huge difference when it comes to mitigating noise levels within a building. There are a number of important considerations M&E contractors need to factor in at the outset in order to provide effective noise management for inhabitants. The human ear is sensitive, and able to pick up everything from the rustling of tissue paper through to the roar of a Formula One car. It is most frequently assumed that 10 decibels sound pressure level (SPL) is twice as loud as 5 decibels, however this is not the case as below 40dB SPL a 3dB SPL increase can generally already be perceived by many as a doubling in loudness. As our ears have different sensitivity across the various frequencies of our hearing spectrum, perceived loudness is very subjective and what is loud to one person may be acceptable to the other. But how exactly does this relate to the subject of water drainage? Noise created by soil and waste systems are all predominantly in the sound pressure level range below 40 dB, but every decibel counts when trying to create the ideal ambience to fall asleep within. It’s important for contractors to consider how even a small change in noise level can affect acoustics in modern buildings. With the sensitivity of decibels in mind, it is vital to ensure that both noise and vibration are controlled during construction. Noise can travel through both the air and the building itself, where the vibrations can move quicker through the building structure. Locating the source of the problem afterwards can be a difficult, time-intensive, and costly process for contractors. Part E of the Building Regulations simply states a minimum airborne sound reduction target for the noise transfer from one room to another, as opposed to other countries that specify a building’s technical services must not exceed an absolute dB level. In order to provide a comfortable environment for occupants, consultants need to get into the habit of specifying above the UK regulatory standard. Problems with acoustics begin once the building is occupied. As verification of the site often occurs without any water flowing through pipes, or before building services are running, noise levels subsequently increase when people inhabit the building. This is an ongoing problem in lower-specification developments, such as student halls of residence, because expert knowledge of the acoustic issue is missing at build stage. High-end developments will often have an acoustic consultant assigned to the development, who will specify pipework and infrastructure that will usually go above and beyond the regulations. 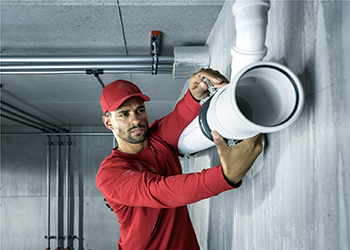 One of the most important considerations to make when it comes to acoustic drainage is that the fixtures play just as important a role as the pipework. Brackets surrounding the pipework play a major part in the separation of vibrations from the walls of a building structure. Noise in pipework happens when water impacts on the pipes, and this problem is increased especially around sharp bends so the bracketing needs to transfer as few vibrations as possible to the wall to ensure minimal noise pollution. Tight deadlines on building construction can lead to M&E contractors purchasing generic brackets for their pipework, rather than the manufacturers’ recommended brackets, and it’s this generic bracket that compromises the acoustic performance of the system. That said, it can be relatively straightforward to tweak the performance of pipes by using different weights of pipe and fittings. A heavier pipe, such as cast iron, is less susceptible to vibration, however it is costly and requires a much sturdier bracket to support the weight. 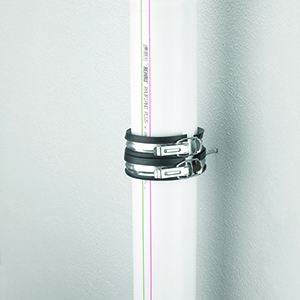 A polypropylene-based drainage system such as Rehau’s Raupiano Plus system is an alternative for a wide range of buildings from modern hospitals, and student accommodation to contemporary skyscrapers. The system features three separate layers combined in a composite construction to create a tough, durable pipe, with outstanding acoustic properties. As awareness of noise levels in our buildings continues to grow, it is vital that effective acoustic drainage becomes part of the M&E Contractor’s toolkit. Preventing the generation of sound is ultimately better than trying to go back to cure the problem and it is becoming apparent that contractors need to pay closer attention to how the building is constructed. Using bracketing that minimises the vibration effect or avoiding direct contact of the pipe with the building structure, are examples of how an M&E contractor can prevent acoustic problems in their projects. Making acoustic pollution prevention second-nature to contractors and developers minimises problems with noise, giving peace of mind to homeowner or tenants that their property is effectively soundproofed from drainage acoustics.